A theme is a set of applications with a common theme. The created themes are used to filter the display of overview maps images in the public interface. 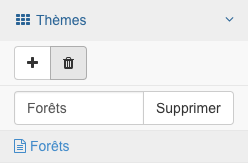 To add a new topic, click on the correspodante icon in the toolbar on the left menu. This shows the addition of themes form as shown below. Please specify a name in the text box provided for that purpose and then click on the “Add” button. This causes the form are gone, adding the topic to the shaft and reload the panel: doc: infopanel to the right of the screen. To delete an existing topic, click on the theme name in the tree, then click the icon to delete in the toolbar on the left menu. This displays the theme of removing form as shown below. Click the “Delete” button. This causes the form are gone and deleting the subject of the table.